By availing our services, MPCS is able to conserve you the time and trouble of constantly checking on numerous customs service providers. We also share professional relationships with a number of customs clearance and freight forwarding agents worldwide; ensuring the prompt and safe delivery of your goods. We offer the services such as: shipment consultancy, export and import custom clearing, documentation, shipment formalities, communication with authority etc. MPCS assures that all documentation will be delivered to you within 24 hours from the arrival of your goods. Our clients may request the following services such as: unloading/loading of imported/exported goods at their preferred destination, weight measurement, packing and the transportation to and from customs station. This physical labor on our part ensures the safe and timely delivery of your goods, which are escorted to their preferred destination. We have hired a team with both the expertise and knowledge that allows them to supply end-to-end solution for both exported and imported goods at market leading prices. 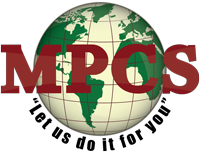 Give MPCS a call and “let us do it for you”.